Coordinate Conversion, Coordinate Calculator, Convert Coordinates, GPS Coordinates Conversion, Map Datum Conveions. Supported projections: Transverse Mercator, Lambert Conformal Conic, UTM, Gauss Kruger, Stereographic, Albers Equal Area, Oblique Mercator and more. 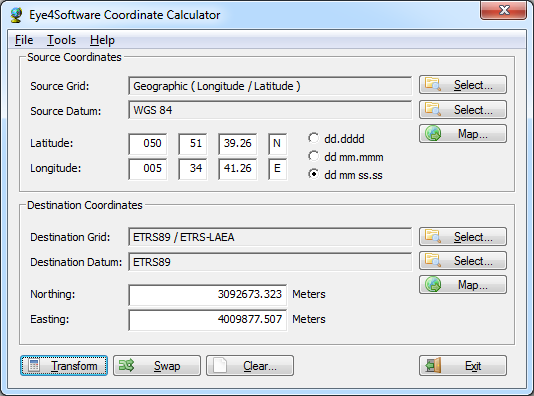 The Eye4Software Coordinate Calculator is an easy to use tool to perform map or GPS coordinate conversions. The software can be used to transform a single coordinate or a batch of coordinates read from a comma separated, database or ESRI shapefiles. The software is shipped with a MS Access database file, containing more then 3500 ellipsoid, map datum and map grid definitions around the world, which are identified by their EPSG code. It is possible to modify the definitions of all datums and map grids stored in the database. You can also create user defined map grids and map datums, so you can extend the database with newly introduced map datums. Supported map projections include: Transverse Mercator (regular and south orientated), Universal Transverse Mercator, (Hotine) Oblique Mercator, Swiss Oblique Mercator, Mercator, Oblique Stereographic, Polar Stereographic, Cassini, Albers Equal Area Conic, Polyconic, Mollweide, Gauss Kruger, Krovak, Lambert Azimuthal Equal Area and Lambert Conformal Conic projection (regular and west orientated). Software can be used with NADCON and HARN/HPGN grid files for North America.